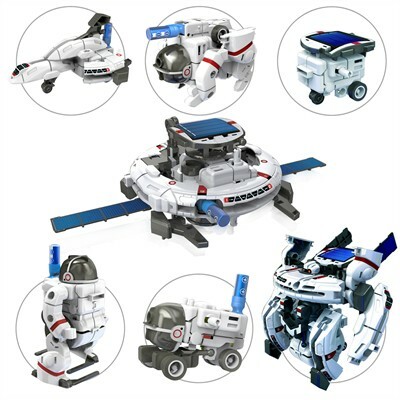 This innovative 7-in-1 solar powered science kit demonstrates different method of powering and charging and at the same time engages creativity and imagination by transforming to different space fleet; Astronaut, Space Dog, Explorer, Mech, Shuttle, Rover and Space Station. The kit includes a solar panel and a micro rechargeable battery which can be charged by sunlight or 2 x AAA alkaline batteries (not included). Tools you may need: diagonal cutter and scissors.